By Thoriq Firdaus in Blogging. Updated on November 13, 2017 . Ghost.org is a newly launched blogging platform, initiated by John O’Nolan, and then developed together with Hannah Wolfe. Ghost started out as a Kickstarter project that successfully raised funding of over $300,000. Many popular brands in tech and blogging fields such WooThemes, and Envato backed the project. The idea behind Ghost is to make the blogging experience easy and beautiful, and unlike WordPress that has evolved as a CMS for creating any kind of website, Ghost is aimed to be a blogging platform, nothing else. In this post, we are going to walk you through installing Ghost locally on your computer. We need Node.js version 0.10. * (the current stable release) to be able to run Ghost. Node.js installation package is available for Windows, Mac, and Linux. Download it here, and install it. If you have installed Node.js before, verify the version with this command in the Terminal: node -v. At the time of the writing, my Node.js installation was outdated, so I need to update it first. Thanks to a tip by Simon Holmes, updating Node.js is so easy. We run the following set of command lines, then wait for a while for the installation process to complete. Let’s verify the version once again. As you can see above, Node.js 0.10.21 has been installed, and we are all set to install Ghost. You can download Ghost from the official website or from the Github repo. We will be using command line and Terminal to install Ghost. Ghost does not come with a step-by-step installation guide like in WordPress or other blogging platforms/CMS that you might have come across. So it might not tougher on those who rarely work with Terminal and command line. Your Ghost blog should now run. 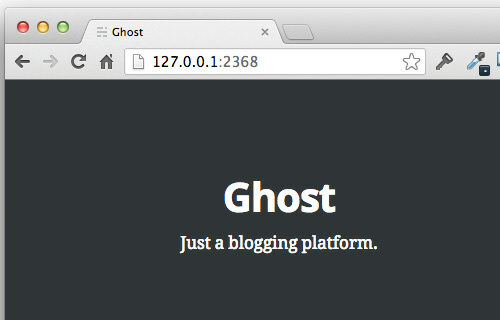 You can access your Ghost blog in 127.0.0.1:2368 URL within the browser. Go to 127.0.0.1:2368/ghost. For the initiation, input your name, email, and password. Once that is done, you will be redirected to the back-end administration, where you can write, edit, and publish post. The layout is minimal yet refreshing. Hit the + New Post button to start creating a new post. 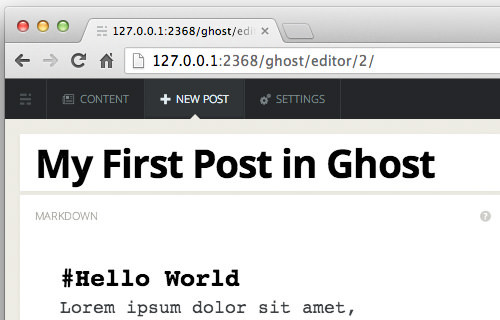 Ghost uses MarkDown. You can head over to our previous post to learn how to write using MarkDown. Ghost is a new blogging platform with a very active development, and they plan to add a bunch of new features in the next version. At the time of the writing, Ghost is missing several trivial features for a blog. First, you can only assign Tags for the post; there is still no way to manage post by category. The Tag archive however is not yet accessible – you cannot sort posts that are saved under Tags on the front-end. Plus, we cannot schedule post, and comment to the post as well. Despite all that, I’m looking forward to how this new platform will grow, and things that will be built around it in the next couple of years.